It’s designed in Kabulonga. And obviously the logical brand for new clothing design in Zambia, just take a look at our subsidiaries and you’ll understand :-). 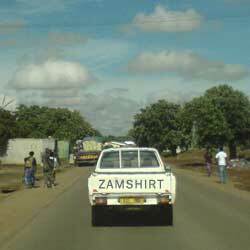 The aim of ZAMSHIRT is to create good looking prints of today’s Zambia, whatever that looks like. If you too are tired of Africa T-shirts with poorly drawn lions lying under the text “Safari” you might find something you like in our small range of T-shirts and tank tops, so check out the Store!